“They say nothing's perfect, but your gig at Bacca Pipes on Friday came pretty close.” . Fil Campbell and Tom McFarland have been part of the Northern Irish folk scene since the early 90s. With the combination of vocals, guitar and percussion they have garnered a following for their fun approach to both new and old songs. A new CD of contemporary songs, featuring both Tom and Fil on vocals, is due for release this Summer, and they will be playing at festivals and theatres in the coming months to promote that. 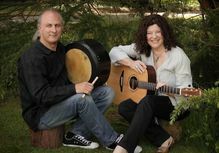 The couple play and sing a mix of original, traditional and contemporary Irish songs with occasional nods back to the popular Irish folk songs they grew up with. Their set is full of fun and banter and Fil’s passion is to get everyone singing so there are always lots of choruses, so be prepared! With 6 solo CDs to date, and several project recordings over the past few years, Fil’s repertoire is varied and eclectic. She is particularly known for a large body of work for RTE TV entitled Songbirds that profiled the women singers of the past, which she researched and presented herself and some of these songs still feature in their set. Originally from Belleek in Co. Fermanagh, Fil has been gigging regularly since she was a teenager and together with Tom who hails from Belfast, they have performed all over Europe, Ireland, the USA and UK, at festivals and folk clubs, on radio and TV. Tom has played drums and percussion for singers as diverse as David Knopfler (ex Dire Straits), Finbar Furey and Ben Sands and has his own recording studio and film editing suite specialising in acoustic and spoken word recordings.